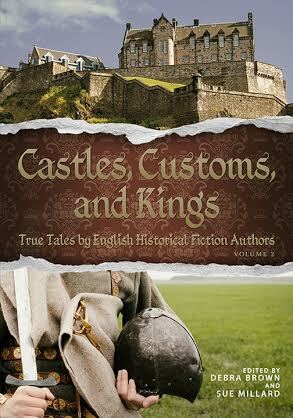 Today, something a little different, to celebrate the 4th anniversary of the English Historical Fiction Authors blog and the publication of their second anthology of articles: Castles, Customs, and Kings: True Tales by English Historical Fiction Authors, volume II. For further information and links, including how to link to other posts in the CCK Blog Hop, see the bottom of this post! My background is in political history. I love British politics, current and not so current. I wrote my high school dissertation on an the 1784 general election (think “Blackadder the Third” … startlingly accurate), chose political options as an undergraduate whenever possible, and studied 18th century political discourse for my PhD. Unsurprisingly, my career path has also taken me close to politics. 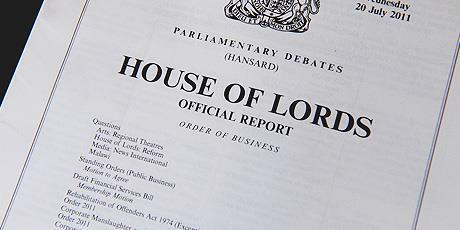 Although I am a librarian by training, I spent a year working in a government department, and one of my duties was to compile daily lists of parliamentary debates. Ah, Hansard… Hansard, since 1803(ish) the official record of British parliamentary goings-on. If it’s not in Hansard, it didn’t happen. Modern Hansard comes in densely-typed A4 packets, sewn together to form a booklet from about a centimetre to a centimetre and a half in thickness (depending on how verbose members are feeling on any particular day). Dull, you say? Anything but. My Hansard perusals were the highlight of my day. You see, Britain’s Parliament has been around for a good long while — its history goes all the way back to Magna Carta (if you’ve been living in a cave for the past year of 800th-anniversary celebrations, that was signed in 1215) and the 13th century. Simon de Montfort summoned the first “proper” parliament in 1265, incuding representatives from all around England. That’s 750 years of (sort of) regular parliaments, and 750 years’ worth of weird and wonderful customs and traditions. Because if there’s one thing we Brits love, it’s a weird and wonderful custom. So, ever wondered why poor old Black Rod gets a door slammed in his face every time Parliament is opened? Or why the Lord Chancellor sits on a woolsack? Or all this fancy politeness of only referring to other members as “the honourable Member for [insert random constituency here]”? Wonder no more…. … is really quite simple. It’s a statement of the Commons’ independence from the Crown. It goes back to the 17th century, when Charles I came into the House of Commons in 1642 to arrest five MPs. They had been forewarned and escaped, but it was the last time a monarch was allowed to enter the Lower Chamber. After all, if the Civil War proved one thing, it was that even the monarch was not above British law. Nowadays Black Rod (the person in charge of Westminster security — so named because he carries a black staff as a symbol of his office) summons the House of Commons to come to the House of Lords to hear the Queen’s speech whenever she opens Parliament. Because he represents the royal authority, the door of the House of Commons is slammed in his face as he arrives, and he has to knock three times to gain admittance. Yes, that is the political equivalent of “We’re the kings of the castle, and you’re the dirty rascal”. 2. 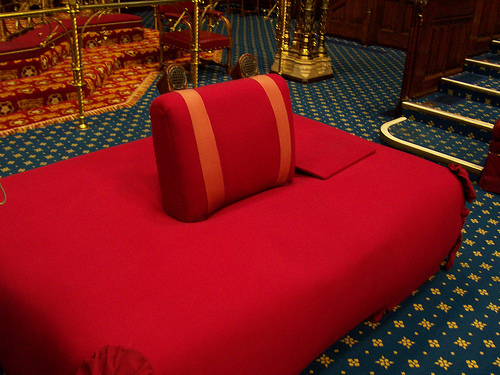 Why does the Lord Chancellor sit on a Woolsack? This one is also quite simple: because wool was one of England’s most important products and exports. Edward III made it compulsory for his Lord Chancellor to preside over the Grand Council on a bale of wool. The current Woolsack is stuffed with wool from around the Commonwealth. I’ve actually come across a few examples of this occurring in my research. “Naming a Member” is a disciplinary procedure in the House of Commons. Using an MP’s name is forbidden: only the Speaker can do it, when he /she calls on a member to speak in debate. Otherwise, it’s all “the honourable Member for” whichever borough elected them in the first place. Thus David Cameron (if he weren’t prime minister) would be “The honourable member for Witney”, and George Osborne (if he weren’t Chancellor of the Exchequer) “the honourable member for Tatton”, etc. However, if an MP is especially naughty — maybe they might accuse another member of telling a direct lie[*] — the Speaker might “name” them, by saying “I name the Honourable Member for Mouldy-in-the-Hills, Ms Winterbottle, for disregarding the authority of the Chair”. Big deal? Maybe, but the named MP is then suspended for five days. If Ms Winterbottle is named again during the same session, she is suspended for twenty days. If she does it a third time, she might not sit again for the remainder of the session. Accusing another MP of lying is an example of “unparliamentary language”. (Euphemisms are allowed: Winston Churchill once accused another member of “terminological inexactitude”). Swearing and general insults are also not allowed. According to a House of Commons Factsheet on traditions of the House, “Among the words to which Speakers have objected over the years have been blackguard, coward, git, guttersnipe, hoolian, rat, swine, stoolpigeon and traitor”. MPs can apologise for unparliamentary language by “withdrawing” it. Otherwise, if the language is not withdrawn, then the Speaker may order the MP to withdraw instead. Occasionally, refusals to withdraw “unparliamentary language” have led to arguments been taken, as it were, outside. In 1798, the prime minister, Pitt the Younger, accused an opponent, George Tierney, of deliberately obstructing a government measure. When Pitt refused to withdraw his comments, Tierney challenged him to a duel. Both escaped unhurt. Why? Because in centuries past, the Speaker would lay the advice of the Commons before the monarch. If the monarch didn’t like it… the Speaker could be imprisoned, or even executed. It doesn’t happen any more, of course, but still! The Mace: sits on a table in front of the Speaker in the House of Commons, and is carried in and out in procession each day. It represents the Royal authority and, unless it is present, Commons decisions are not binding. It is occasionally a focus for parliamentary protests, therefore: any MPs who so much as touch it are “named” and suspended for five days. John McDonnell, MP for Hayes and Harlington, was suspended in January 2009 for trying to carry it off in protest during a debate on Heathrow Airport. Swords: MPs used to wear them, and in the 18th century government members were still required to wear Court dress — which included a dress sword. Nowadays, as a Commons Factsheet puts it, “It is not now permitted to carry arms of any kind into debate”. There are still sword hangers in the cloakroom, though, and the Treasury and Opposition benches are still two sword lengths apart …… just in case. Armour: Also not allowed: since 30 October 1313, it seems. If you were wondering, yes, it’s specifically forbidden. An anthology of essays from the second year of the English Historical Fiction Authors blog, this book transports the reader across the centuries from prehistoric to twentieth century Britain. Nearly fifty different authors share the stories, incidents, and insights discovered while doing research for their own historical novels. From medieval law and literature to Tudor queens and courtiers, from Stuart royals and rebels to Regency soldiers and social calls, experience the panorama of Britain’s yesteryear. Explore the history behind the fiction, and discover the true tales surrounding Britain’s castles, customs, and kings. Click here to view the other posts in the CC&K Volume II Blog Hop!